Remodeler serum concentrate specifically formulated to reconstitute the skin deep, ensuring a solid cellular cohesion and powerful rejuvenating action. The unique combination of technology [meso]recovery complex® conveyed by biovectors to increase the penetration of active substances with highly firming and anti-aging properties, stimulates collagen production and strengthens the extracellular matrix, restoring the dermal-epidermal junction. The facial oval is redefined and repositioned. The texture of the skin is refined and the wrinkles are visibly smoothed. 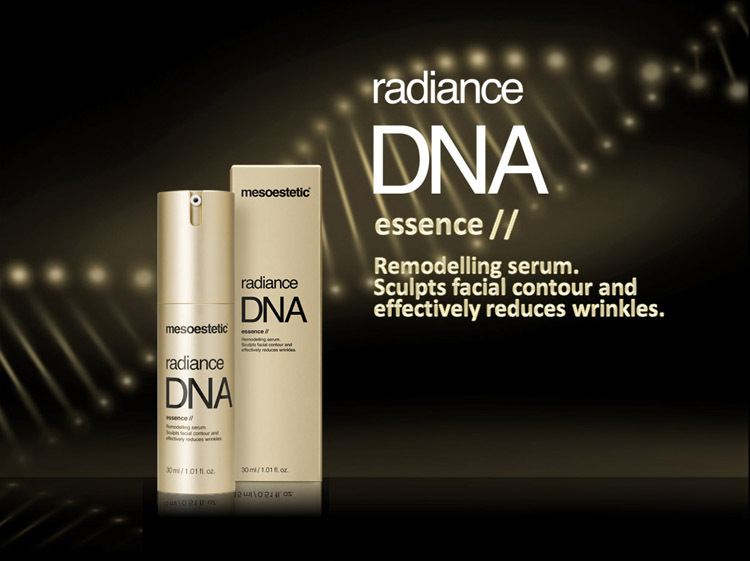 A bottle of Radiance DNA – Essence for home maintenance leads to results obtained in the beauty salon. Concentrated remodelling serum specifically formulated to reconstitute the skin in depth, ensuring solid cell cohesion and potent rejuvenating action. The unique combination of [meso]recovery complex®, together with active substances with highly tightening and anti-aging properties, stimulates collagen production and strengthens the extracellular matrix, restoring the dermo-epidermal junction. Redefines and repositions the oval of the face. It makes skin texture thinner, and wrinkles are noticeably smoothened. Use in the morning and at night, over completely clean skin. Apply onto the face, neck, and neckline, outlining the oval of the face. Then, start to apply the corresponding treatment cream.